Flannel Nightgowns... Night gowns come in so many different styles and fabrics, but during the fall and winter months, flannel is one of the best and most popular sleepwear fabrics. What is the appeal of flannel? Its soft warmth and feel makes it a tried and true favorite, especially if you enjoy keeping the chill away on a cold winter's night. The nice thing about flannel sleepwear is it's suitable for all ages and occasions - from toddlers running around the house on Christmas morning in their favorite Mickey Mouse flannel pajamas to sophisticated grandmothers lounging in high-end satin lined tartan flannel nightgowns and matching robes, there is a wide range. Flannel is great for wearing around the house and also makes the perfect travel companion when staying away from home and visiting friends. Another advantage to flannel nighties and sleepwear - they require no special care and can be easily washed at home; they dry relatively quickly. Flannel tends to last and last - a nice bonus for making your dollar stretch further. Favorite nightgowns, pajamas and chemises are eventually replaced, not due to wear and tear but because a change in style or size is needed. Lingerie Tip – Flannel sleepwear becomes softer and cosier with repeated washing. Machine wash on the delicate cycle and line dry for best results. When it comes to price, there is a great range depending on the quality you are after. 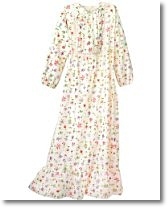 If, you're looking high end, expect to pay several hundred dollars for a nightgown. But, if practical and plain are your goal, even the cheapest are normally more than adequate. Obviously size is important, but the style is just as important and can be anything from plain to elegant to something a little risque. Want to personalize? Have your sleepwear monogrammed - a great personal touch which really rings true if it's a gift you're giving. 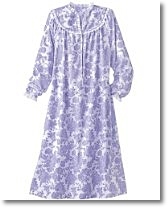 The long and short of it - most associate flannel night gowns as floor length and long sleeved. But, this is not the case, and length can vary considerably; sleeves can be short or long. Colors and patterns vary from conservative tartans to sophisticated solids. Opt for a color and design that complements your personality. One of the major drawbacks is that flannel tends to be seasonal and is usually only available during the fall and winter season. And, during the summer months since flannel nightgowns tend to be thick and retain heat they can be too warm to wear. It's also important to remember that some flannel fabrics (especially synthetics) are potentially flammable, so extreme care should be taken around any open roaring fires and smokers. All in all, cosy flannel sleepwear is an incredibly popular choice for most women. It also makes a great gift, so should you be short of ideas, consider this favorite. Your reward is sure to be a great smile and a heartfelt "thank you". Shopping online for flannel nightgowns, cotton nightgowns, ladies sleepwear and intimate apparel is easy on eBay clothing. From romantic victorian nightgowns to popular Miss Elaine nightgowns, the selection of nightgowns and sleepwear, has never been more affordable or offered better options.